Immunotherapy has brought promising breakthroughs for several forms of cancer. Now, researchers are applying the knowledge they’ve gained in previous clinical trials as they look into how immunotherapy might provide additional treatment options for patients with recurrent cervical cancer. The introduction of a vaccination and screening test for cervical cancer was a significant breakthrough in prevention and identification, but cervical cancer remains the second leading cause of cancer-related mortality in women. 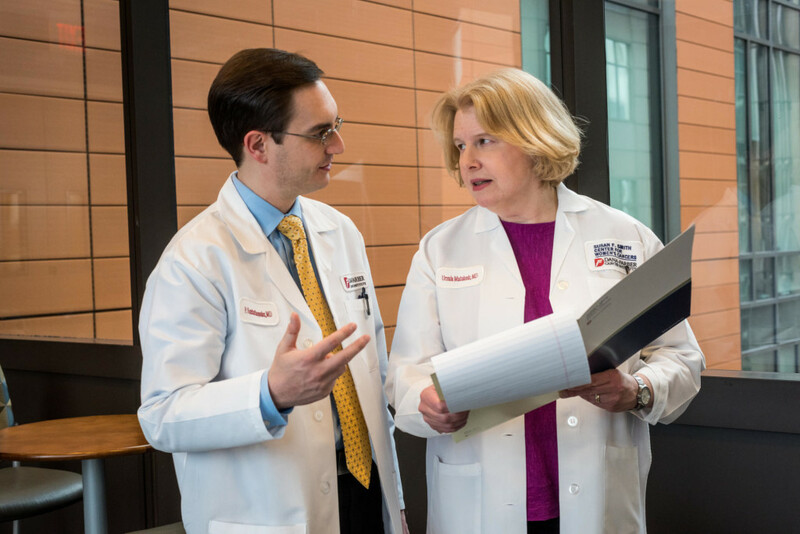 Panos Konstantinopoulos, MD, PhD, and Ursula Matulonis, MD, are studying immunotherapy as a treatment for cervical cancer. Early trials focused on single agents known as an anti-PD1 monoclonal antibodies. These remove a blockade created by the cancer cells that prevent or reduce the immune response. As a result, these “checkpoint inhibitors” allow the immune system to once again recognize the tumor and respond to it. Researchers recently concluded a phase 2 trial of the single agent drug nivolumab (Opdivo) for recurrent cervical cancer. Of 24 patients — 19 with cervical cancer, 5 with vaginal cancer — 26 percent of patients with cervical cancer had a response to the drug. “That is encouraging activity,” says Matulonis. Researchers will continue to refine the single-agent regimen through further trials, in the hope of identifying what makes one patient’s response more robust than another. But researchers are also pursuing an alternate path: Combination trials. In another clinical trial, researchers are looking at how two immunotherapy drugs — durvalumab (IMFINZI) and tremelimumab — combine with radiotherapy, to see if radiation boosts the immune response. Learn more about cervical cancer from the Susan F. Smith Center for Women’s Cancers at Dana-Farber Cancer Institute.